Amity® audio and hifi new products and offers! 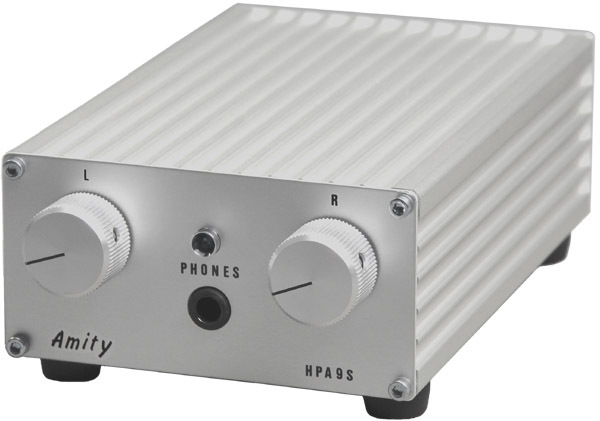 New: Amity® HPA9- and HPA10- Headphone Amplifiers ! very high quality and cost less than $ 390.00 (Euro 289.00). 'High-End' quality and cost less than $ 1,060.00 (€ 790.00). Displayed above are our new Amity® HPA9- and HPA10- headphone Amplifiers. Our High-End HPA10- family has an exclusive double chamber housing with power circuits in the left chamber and audio circuits in the right chamber. The single housing HPA9- is 110mm wide and the double housing HPA10- is 222mm wide, both are 64mm high and 220mm deep. There are 4 variations of each:>HPA9-S-1, HPA9-S-2, HPA9-X-1, HPA9-X-2 and HPA10-S-1, HPA10-S-2, HPA10-X-1, HPA10-X-2. Please note: -S for silver top and bottom, -X for black top and bottom, -1 is for 1 knob (stereo), -2 for 2 knobs (double mono). Technical information is approximated to cover both series. Both have, DIN rated, close to 0 ohm output impedance and less than 0.002% distortion. Power supplies are +/- 12V (HPA9) or +/- 15V (HPA10). Output current sinus is more than +/- 0.3 Ampere and impulse current more than 1 Ampere. Both drive headphones with impedances from 4 Ohm up to 600 Ohm. Frequency response is flat up to 100 kilohertz. Headroom is very large and definition is very fine. Slew rate is faster than 1V/µsec. Phase shifting is small with a small phase shift from 10 to 50 hertz to compensate for the slow bass response from most headphones. Fact is: The Amity® HPA9- and HPA10- headphone amps improve the sound of dynamic headphones and gives them an extremely high fun factor!